It’s hardly breaking news that cable-news audiences have become increasingly polarized: Conservatives cocoon themselves at Fox News, progressives shelter in place at MSNBC, and CNN does its best to play to the middle. But a quick look at the ratings for President Trump’s State of the Union address Tuesday underscores just how borderline comical TV news tribalism has become. Fox News, which of late has turned into Trump TV, dominated the night, attracting 11.7 million viewers during the 90-minute speech and 10.5 million viewers for its initial post-speech analysis. But as soon as Representative Joe Kennedy III began to offer up the Democratic response, Fox audiences fled: The network’s audience dropped to just 6.7 million, a nearly 40 percent decline from the viewership for Trump’s speech. It wasn’t just conservatives who voted with their remotes, however. While the actual State of the Union address was the most-watched show on Fox News, CNN, ABC, CBS and NBC Tuesday, on MSNBC, progressive audiences actually showed up in bigger numbers to watch Kennedy’s brief speech. Per Nielsen, 3.3 million viewers tuned to MSNBC at 10:42 p.m. for the 13-minute talk, compared to 2.7 million who watched Trump’s speech on the network. Even MSNBC’s 11 p.m. post-speech analysis (2.9 million) did better than the actual SOTU — at least on the progressive-leaning network. Meanwhile, keeping with its centrist branding, CNN’s numbers were pretty much even during prime time: 3.1 million watched Trump on the all-news channel, while nearly as many (2.9 million) stayed tuned in afterwards. Interestingly, back in 2016, during President Obama’s final SOTU, a similar — if less pronounced —dynamic was evident. Fox News drew 3.5 million viewers for the president’s speech, and 3.7 million for the GOP response. Conversely, 2.5 million presumably progressive viewers caught Obama’s speech on MSNBC, while 2.1 million stay tuned for the Republican response. 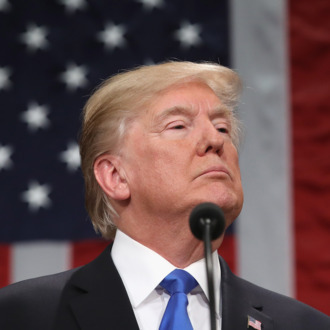 As for the overall audience for Trump’s speech — cable and broadcast outlets combined — Nielsen says 45.5 million watched the speech, down a tick from the 48 million who watched Trump’s not-quite-a-State of the Union speech last year and President Obama’s first SOTU in 2010.